OSWEGO – Girl Scout leader Kim Westcott gathered Girl Scout Cadettes and Seniors from several Central New York troops on a recent evening on Oswego’s West Pier for lessons about event planning, budgeting, organization and leadership. 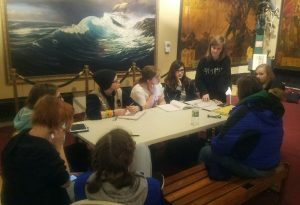 A coalition of Girl Scouts from Central New York troops meet regularly at the H. Lee White Maritime Museum to plan the Museum’s annual Pirate Days summer event. Pictured from left are: Aurora Baker, Tabitha Sailer, Christina Koleta, Troop 10566 and 10567 Shayna Risacher, Aurora Lawton, Celeste Mulcahey, Meghan Perras, Ainsley Sailer and Troop Leader, Kim Westcott. Their classroom was the H. Lee White Maritime Museum. Together, these girls helped to shape one of the museum’s signature summer events, Kids Pirate Day. Westcott said she crossed paths with museum executive director Mercedes Niess a number of times over the last few years. Niess, herself a former scout leader, suggested Westcott use the museum as a resource for the troops. That suggestion led to the involvement of Westcott’s girl scouts to assist with several of the museum’s programs. A year ago, the girls took on a larger task, the planning and execution of the museum’s summer Kids’ Pirate Day. Westcott said her troop learned so much from that experience that she opened the project up to a coalition of Girl Scouts from several Central New York troops. These girls are now working on shaping this summer’s Pirate Day event and they are earning their Service to Community Bar in the process. Two of the Oswego Girl Scouts, Aurora Lawton and Celeste Mulcahey, are leading their fellow Girl Scout sisters, and working toward the Silver Torch Award for Leadership. Niess said this project is particularly satisfying to her, not just as a former scout and scout leader herself, but more importantly because it demonstrates the power of the museum to provide a unique educational experience for members of the community. The event utilizes the entire pier with activity stations throughout from the boating center to the vessels and the main building. Located on the West First Street Pier in Oswego’s Historic Maritime District, winter hours for the Maritime Museum and Treasure Chest Gift Shop are Monday through Friday from 10 a.m. – 5 p.m., weekends by appointment.